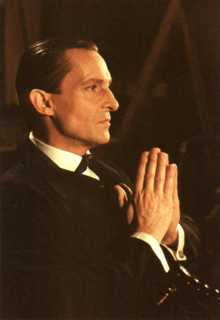 For some people, Jeremy Brett, will always be the Sherlock Holmes. He portrayed my good friend over 40 times in what the creator of the Granada Series, Michael Cox, meant to be the genuine article. There was a dangerous and eccentric edge to his playing of the role which fascinated men and attracted women. His portrayal included some mannerisms that are so uncannily similar to those of Holmes that I find myself fooled occasionally! The programmes spanned six series plus five feature-length episodes and a short episode broadcast as part of Telethon ’92. The latter has never been officially released though it is available on the Internet. The whole project started with the best intentions – of keeping true to the stories as I had recounted them – but the commercial considerations of the powers that be at Granada and Jeremy’s failing health meant that the promise was not to be fully realised. Some liberties were taken with the Canon. For instance, it was decided that I should not be married! So at the end of The Sign of Four, Mary and I go our separate ways. In The Mazarin Stone (from The Case-Book of Sherlock Holmes), the penultimate episode to be shown, Jeremy was too ill for filming having collapsed at the end of filming (sadly somewhat prophetically) The Dying Detective (from His Last Bow). The script was rewritten using Holmes’ brother Mycroft in his place. The script also includes elements of the Three Garridebs (from The Case-Book of Sherlock Holmes) with the result that David Stuart Davies (see below) calls it “a mess”. There was also a lost opportunity to bring in the poignant moment from The Three Garridebs where Holmes thinks I have been shot. Mycroft also appears to take my role in The Golden Pince-Nez (from The Return of Sherlock Holmes). Two of the feature-length episodes strayed too far from the Canon for most people’s liking. These were The Last Vampyre (based perhaps too loosely on The Sussex Vampire from The Case-Book of Sherlock Holmes) and The Eligible Bachelor (based on The Noble Bachelor from The Adventures of Sherlock Holmes). The Hound of the Baskervilles was another two-hour episode that was so disappointing that Jeremy Brett wanted to do it again. David Stuart Davies refers to the hound jokingly with a reference to Silver Blaze as “the dog that did nothing in the ratings”. The Sign of Four was the only feature length episode that provided a creditable performance. In the midst of all this, in 1988 and 1989, Jeremy Brett and Edward Hardwicke toured with a stage play entitled The Secret of Sherlock Holmes in which it is proposed that Moriarty is just a figment of Holmes fevered brain. I can scarcely put into words what I think of that! You can judge for yourself as the Granada series is shortly to be available on DVD as Sherlock Holmes – Complete Collection. If you want to know more about Jeremy Brett, his life and career, I can recommend two books. The first is my favourite as it’s written by someone who knows Holmes and I very well, David Stuart Davies, Bending The Willow. David’s enthusaism for Holmes led him to become a founding member of The Northern Mugraves Sherlock Holmes Society. He has also published Holmes of the Movies surveying the Great Detective on film. The second is The Man Who Became Sherlock Holmes by Terry Manners – his first foray into the world of Holmes. None of these books appear to be available new so you will need to consult a good second-hand bookseller to obtain a copy – or maybe your local library. There is also a very good website devoted to Jeremy Brett called The Brettish Empire. Few people realise that one other person called Brett also portrayed Holmes. It would be an erudite scholar who knew the answer to that little puzzle! Stage and screen actor Eille Norwood (1861–1948), whose given name was Anthony Brett, played the role of Sherlock Holmes in forty-seven films between 1921 and 1923 as well as portraying the Master on stage in The Return of Sherlock Holmes in 1923. Reference: Christopher Redmond, A Sherlock Holmes Handbook (Toronto: Simon & Pierre, 1993), 165. Brett was a splendid Holmes. His work is unparalleled. If only he had not suffered from his health tribulations, he would have completed filming the entire canon and would have been alive and enjoying his much deserved success and recognition ! I agree entirely. If he had survived, and have not been so ill for so long, with the two great Watsons we might now have the entire Canon on film.